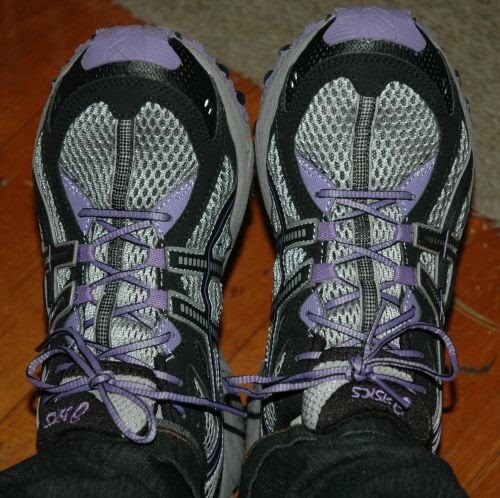 Who doesn't love shoes, even if we are talking dead practical, 'only got them because I really needed them' cross-trainers? Nobody. Everyone's into shoes. Even guys. Today I was buying a dress for the upcoming Wedding of the Year and decided the moment was ripe to replace my old Asics, which are now about 7 years old. I know I had them when I did my PT training in England, so they are at least that old. The young, male, 'built like a rugby prop' sports shop assistant was very obliging. He ran back and forward between shop and supply room as I tried on nearly every version of every brand and almost didn't roll his eyes when I told him what I really wanted was ones that would look cute when I'm walking around Europe at the end of the month. I really wanted cute sneakers. 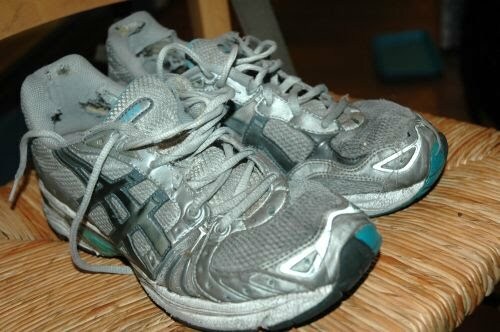 I tried reeboks, nike, new balance, all of which looked great but didn't feel as great as my old shoes. After deep conversations about gel soles and so on, I ended up with another pair of Asics and even managed to find some that were not white. The Asics were also a lot more expensive than the others, but, seeing as my musculo-skeletal specialist gave me the very hard word about hard surfaces and living with a ruptured disc, I decided it was worth it. I'm sure that the last thing The Programmer needs when we are travelling is me whining about a sore back, or knee. The new shoezies feel great. AND they have purple on them ;) Purple. That's girly. My old shoes felt great on too, but when sheos begin to look like this (below), it's time to let go. you can't really see the holes that had formed in the shoe just above the toes or the sole peeling off at the back, plus the way it had scuffed down to the foamy stuff at the back, but they have definitely completed their useful lifespan, with honour. Now they shall start a new incarnation as my gardening or walking through mud shoes. An equally honourable occupation. Why don't male shop assistants EVER get the importance of cuteness? Fit, comfort, impact absorption, stabilisation and suitability for your particular sport are all important too, but how can you possibly step out in a pair of shoes that are just downright ugly? I have developed a hatred of white sneakers. They just look so 'training'-ish.